Gilbert’s Bacon Log v2.0: The Bacon-Shrimp Log — Random Scribblings ..Random Scribblings ...	Gilbert's Bacon Log v2.0: The Bacon-Shrimp Log - Random Scribblings ..
← On Outsourcing Your Life: Who Owns Your Data? 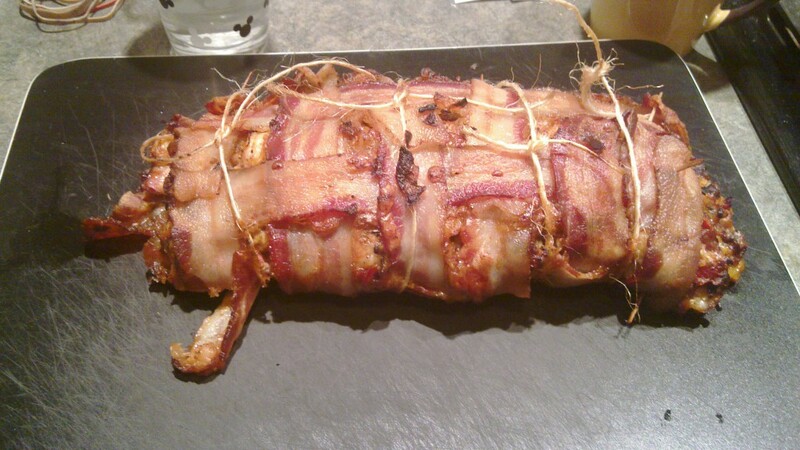 Since the Christ­mas Bacon Log was such a suc­cess, when my wife was try­ing to decide what she want­ed for her birth­day din­ner, I sug­gest­ed a “Bacon-Shrimp” Log. Chris­tine likes any­thing with shrimp and the idea of a bacon-shrimp log appealed to her, so this is a record of us set­ting about mak­ing it. 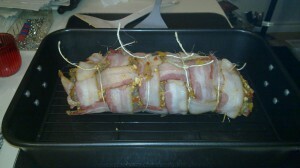 One of the improve­ments we had decid­ed upon at Christ­mas was to com­bine the non-bacon ingre­di­ents into one lay­er. This neces­si­tat­ed chop­ping them fin­er and mix­ing (in that recipe) the ingre­di­ents with the sausage. That will prob­a­bly also require the addi­tion of an egg to keep every­thing togeth­er. In hind­sight as I type this, that might have been a good idea (the egg) here too. 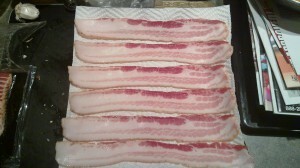 Anoth­er improve­ment that was more hap­pen­stance than plan was that this pack­age of bacon was nar­row­er. 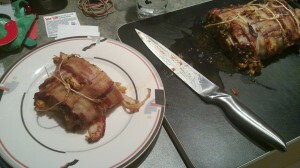 For the Christ­mas log, we had 7 by 7 strips of bacon with 2 strips left over (which we used on the ends). For this log, I was able to make the bacon mat with 6 dou­ble-long strips by 7 strips. I left more spac­ing between the strips as well. Remem­ber that prepar­ing the bacon mat requires that you par­tial­ly cook the bacon. In my expe­ri­ence, in my 1200 watt microwave, one pound of bacon, lay­ered in paper tow­el is prop­er­ly par­tial­ly cooked by cook­ing it for 4 min­utes on 100% pow­er. The goal is to make the bacon some­what stiff by remov­ing the water with­out mak­ing it brit­tle (which hap­pens when you ren­der the fat). One pound of bacon will make 3 or 4 lay­ers this way (paper tow­el between each). Remem­ber to use good qual­i­ty paper tow­el as the cheap stuff will stick to the bacon. 2 lb shrimp, shelled, deveined and diced. 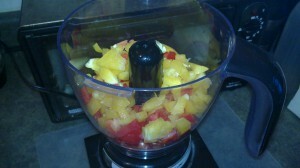 1/2 yel­low and 1/2 red sweet pep­per, diced. 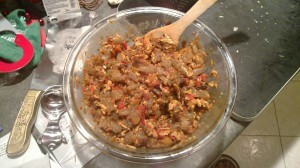 1/2 lb Havar­ti cheese, shred­ded. 1/2 lb but­ton mush­rooms, diced. The bacon needs to be pre­pared as above. Once you have the par­tial­ly cooked bacon, you need to weave your mat. The eas­i­est way I’ve found to do this is to fold back the bacon that will go “over” the next cross strip and then to place the cross strip. 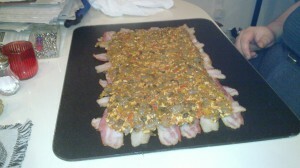 When you come to the end of the length-wise strips, over­lap the next strip by about 1.5 bacon widths. Pret­ty much every­thing but the shrimp and the cheese is going into the fry­ing pan. Again here, we’re pri­mar­i­ly elim­i­nat­ing the water, but I find that the gar­lic and papri­ka fla­vors are more mel­low when stir fried than when they are just fresh. In my case, I put the mush­rooms and gar­lic in first (as they take a lit­tle longer) and added the pep­pers, onion and spices in sec­ond. I used a splash of olive oil here to lubri­cate things, but in a suf­fi­cient­ly non-stick pan, none might be nec­es­sary. Let the pan and the stuff cool for awhile — if they’re too hot, they’ll melt the cheese which will make things some­what hard­er for this step. 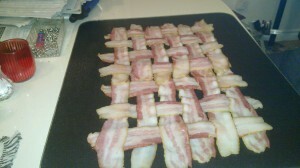 In fact, we made the bacon mat while the veg­gies cooled. Now you want to com­bine the stir fry with the shred­ded cheese and shrimp. This can be done in a large mix­ing bowl. You want to do this step right before you use it as the raw seafood prob­a­bly shouldn’t be in con­tact with the oth­er ingre­di­ents more than is nec­es­sary before cook­ing. 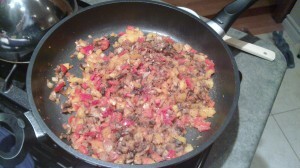 This mix­ture is then spread on the bacon mat about 1/4 inch deep. In hind­sight, it may have been a good idea to add a raw egg or two to the mix­ture to give it more integri­ty, but here, with the shrimp (which is a bit gooey) and no egg, you can see we’ve tight­ly packed the mix­ture into a lay­er on the bacon log. Now comes the rolling of the log. For the Christ­mas log, we had four hands rolling the log and it was sub­stan­tial­ly less dense­ly packed. We also only bare­ly achieved one roll there. Here, in my first video, you can see we get about 1.5 rolls and I man­aged to do it myself while Chris­tine runs the cam­era (the mag­i­cal n900 from oth­er posts). Once you roll your log, you’re going to want to care­ful­ly move it to a bak­ing pan. We rec­om­mend using a rack to keep the log out of it’s own drip­pings. In our case, we had a rack that came with our bak­ing pan. Set your oven on 350F. I did a lit­tle research on cook­ing tem­per­a­tures for shrimp. One arti­cle claimed that a min­i­mum safe cook­ing tem­per­a­ture for Shrimp was 85F. Most oth­er arti­cles used either “5 to 9 min­utes in boil­ing water” (not help­ful) or 145F. We used an oven ther­mome­ter to mea­sure the inter­nal tem­per­a­ture of the log and baked it about 45 min­utes — tak­ing it out when the ther­mome­ter read 145F. My biggest wor­ry was that the shrimp on the out­side of the log would be over­cooked because we had to achieve the right tem­per­a­ture at the cen­ter of the log for the shrimp to be cooked. This wasn’t the case, how­ev­er, as the shrimp near the out­side were con­stant­ly bast­ed in bacon fat — and basi­cal­ly turned into shrimp can­dy. Carv­ing the log was in big wide pieces… par­tial­ly because the inte­ri­or of the log had low struc­tur­al integri­ty and par­tial­ly because the log’s con­tents where the meal. As we’ve men­tioned sev­er­al times, adding an egg or two to the goop might make thin­ner slices pos­si­ble. I’d like to thank and shout-out to the Repub­lic of Bacon. 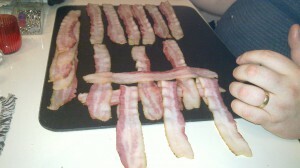 They’re an inspi­ra­tion to us all and their post on the bacon log con­cept inspired this attempt. This entry was posted in Cooking and tagged bacon, bacon log, bacon shrimp log, cheese, garlic, havarti, mushroom, onion, oregano, paprika, shrimp, video. Bookmark the permalink. So will we do v2.1 at Aimee’s place for the B-day par­ty?